The Trouble in Paradise. All photos: © tablehopper.com. 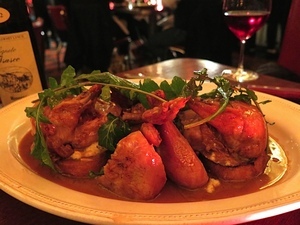 A double order of the roasted chicken. The moody dining room, with a glow from the kitchen. April Bloomfield has taken over the restaurant ownership. Her former business partner, Ken Friedman, accused of multiple incidents of sexual harrassment and predatory, abusive behavior, is no longer involved. Isn’t it nice when things turn out right, nay, better than you hoped? 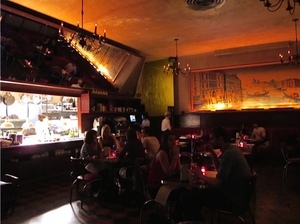 The takeover and saving of ~TOSCA CAFE~ by Ken Friedman and April Bloomfield (known best for New York’s The Spotted Pig) has turned into a rather happy ending. Sure, I miss the quieter nights, but I have never had a Negroni taste so good there, either (the bar now makes the Casino Bar Negroni 1919). 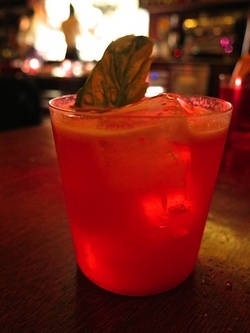 To be honest, it’s bar director Isaac Shumway’s Trouble in Paradise (all drinks, $12) that has the lion’s share of my affection: bourbon, Campari, basil, lemon, grapefruit, and black pepper tincture, so frothy and easy to drink, far too quickly. If it’s late and you’re at the now usually very busy bar, try to ignore the new Tosca patrons talking about their killer app (I actually had to move my seat one evening, I thought I was going to throttle the self-important bro spouting off to his poor date next to me) and order the bar sandwich ($10), which one time was a cheesy dream of truffle cheese, mozzarella, and prosciutto with a zip of lemon oil. Get the crispy pig tails ($9) if there’s more than one of you. The kitchen is open late! 1am, people! The place can be a madhouse (read: no reservations, upwards of 90-minute waits): put your name down, grab a drink, and depending on the wait, why not go browse at City Lights across the street? April Bloomfield and chef Josh Even are doing a hell of a job with the kitchen: the “Point Reyes Blue” salad ($15) comes out on a chilled plate, with spicy croutons and browned halves of Dutch shallots on a mix of beautiful heirloom radicchio. The guanciale-spiked meatballs ($15, not on the menu) are brilliant, especially when paired with the grilled polenta ($17)—do it. 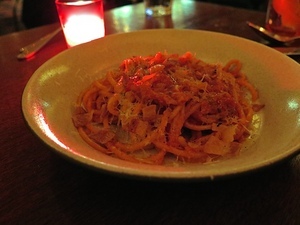 The housemade bucatini ($17) is one of the best pasta all’amatriciana executions in the city: so porky and rich with guanciale (but not salty), perfect spice, and damn, it comes out piping, steaming, thrillingly hot. The music is definitely a miss for me: I feel like it’s some random Pandora station playing songs that are stylistically all over the place, when I’d really like a specially curated and tight playlist. Cut the upbeat, modern stuff. I keep waiting for people to play opera on the long-standing jukebox to interrupt it. Dessert: this is one case when you don’t want to leave the gun and take the cannoli; the grapefruit-Lillet granita ($6) is my pick. And then there’s the updated and boozy House Cappuccino ($12), which has always been cleverly espresso-free. You’ll probably see Tosca’s famed former owner Jeannette Etheredge milling about. If you’re lucky, she’ll take you to the back room and tell you bawdy stories. I keep hoping for the hype to simmer down a notch on this place, but fortunately its rich, classic atmosphere does a lot to cover up the annoyance caused by the new-to-Tosca, blustery crowd. For details on the fantastico mostly Italian (and Chianti-laden) wine list by Ceri Smith (who collaborated with Bonny Doon’s Randall Grahm), I’ll leave it to Alan Goldfarb’s wino piece here.